Abathur: Evolved Bundle is going to be available as a part of Twitch Prime offer starting later this month. Stay tuned for more details. A new Lowko Announcer is now available. A set of 8 comic portraits have been added for players who own War Chest: Katowice 2019 for at least one race. Queens can now properly spawn a Creep Tumor on ramps in certain Heart of the Swarm campaign missions, and Co-op Missions. Fixed an issue where incorrect portrait could appear for structures for certain commanders. Ascendants with multiple Power Overwhelming stacks no longer take bonus damage from the Black Death or Double Edged mutators. Dehaka’s Drone no longer morphs into a structure while holding to a Xenon Crystal on The Vermillion Problem. Primal Host now properly attack enemy Creep Tumors with its Locusts. Murvar now dies properly when Murvar’s Den is destroyed. Enemy units will now properly take damage from Psionic Explosion when Dehaka devours a Psionic unit directly after spawning or respawning. Fixed an issue where the first charge of Greater Primal Wurm could sometimes not be properly given to the player. Nova’s air units can now be properly deployed in areas without ground pathing. Fixed an issue where units dominated by Vega could be attacked by an allied Stukov’s Apocalisk. Void Arrays no longer share the same cargo space as Kerrigan’s Omega Worms. Ultralisks can no longer be stunned by Chokers. Civilians can no longer become stuck outside neutral buildings when retreating from lava. The bonus objective can no longer be targeted by a Viper’s Abduct. Fixed an issue where the bonus objective could be stuck. Fixed an issue where Amon’s Disruptors could fear units without detonating its Purification Nova while the Fear mutator was active. 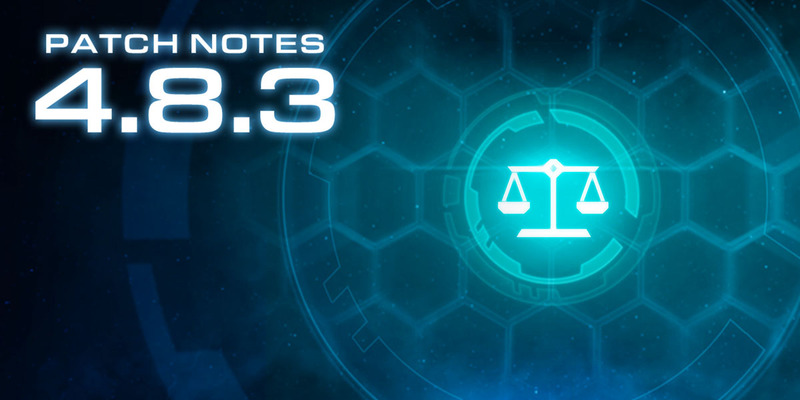 Protoss rewards now properly match the level that they are awarded at. Damaged Spore Crawlers and Spine Crawlers with Simulant skins equipped no longer leave their fire effects behind when they are uprooted. Visual effect now properly appears as intended when placing a Pylon with the Forged skin. Textures at certain locations were updated to make cliff edges and pathable areas clearer and more visible. Textures near base placement locations were updated to be more centered. Terrain updated near the natural base to prevent Photon Cannons from being walled in at certain locations. Certain doodads were removed to prevent units from hiding inside. Fixed an issue where Sentries could be blocked after being warped in. Pathing now properly matches the terrain near the starting ramp locations. Faction emblems and selection circles are no longer hidden by certain doodads. A doodad is now properly centered at a base placement location. Inhibitor Zones placed on higher level terrain will now properly animate. Inhibitor Zone Generator models and mini map icons updated. Time Warp's effect no longer goes back to the enemy after Neural Parasite ends. Stalkers can no longer be targeted at the original Blink location. Fixed an issue where toggling on mouse drag scroll could cause the cursor to appear in the middle of the screen. Help menu now properly displays Cyclone’s Upgrades. Fixed an issue where the Polarity mutator would display its icon over friendly units and structures.